Henri: "Nobody Here?" - Pierre: "Oui!" 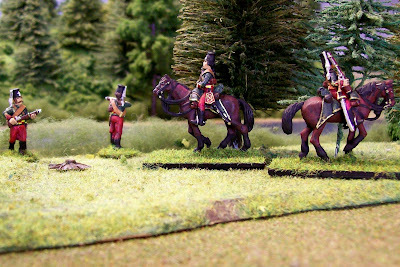 Two squadrons of Legion de Fischer Chasseurs a Cheval arrive to scout for the foe. They dismount and advance to find the foe. 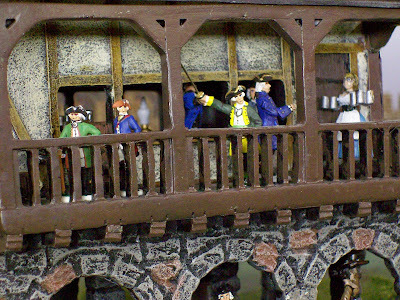 Each squadron has one horseholder vignette. 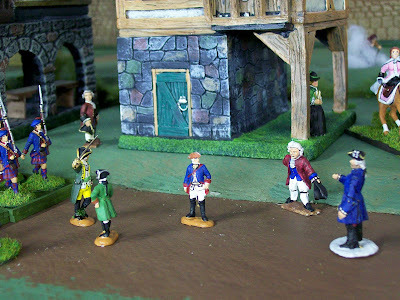 We are now preparing for the annual light troop game on 5 December 1759/2009. 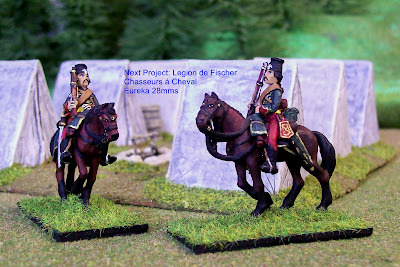 Soon the entire Legion de Fischer will be on our tabletops. 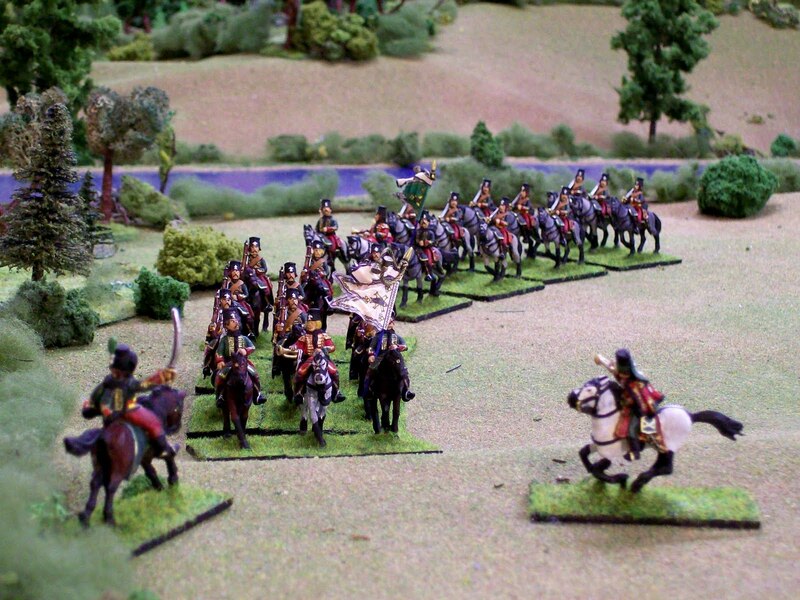 Completion of the four squadrons of the Legion de Fischer Chasseurs á Cheval is the final component. Since late last year, Randy and I completed two battalions, two battalion gun crews plus four dragoon squadrons; mounted and dismounted. 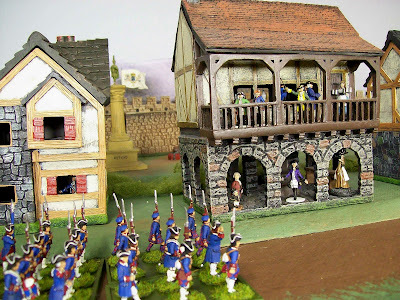 Miniatures are 28mms from Eureka. Lovely designs and the horses are perfect. The actual casting is from the brand new Saxon SYW range. 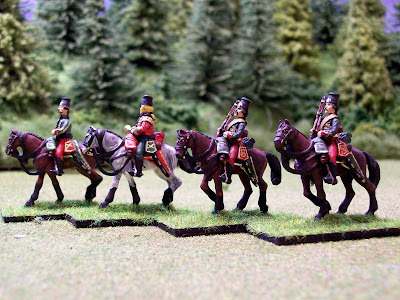 We're painting them as French as Fischer's light cavalry though. 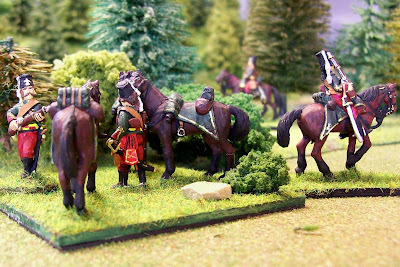 We will also have dismounted chasseurs in several action poses plus horse holder vignettes. These are shown below. Thank YOU Eureka! Images enlarge by clicking on them. Camp scene above kindly on loan from the collection of Der Alte Fritz. Elsewhere a section of chasseurs has dismounted. Taking a look in several directions. Personne à travers le stream non plus? Pas encore. 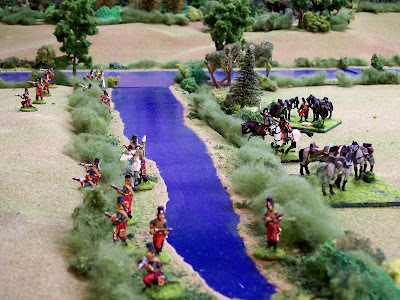 Situation: Three Days Before The Battle of Schaumburg. Images enlarge agreeably if you click on them. Please do so. Inside the Old Guild Hall, food and beverages are being set out for important personages. While outside a parade commences and finely-dressed people congregate to observe. Frankzonians left to right: Count l'Beauchamp, none other than the Hurtzshog of Frankzonia and 'lMarquise de Hottatrot. 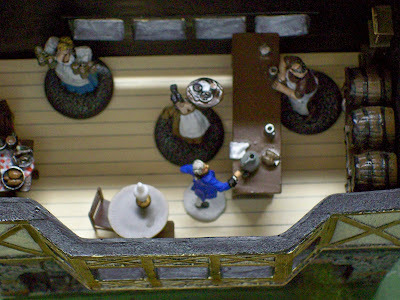 The tall man rightmost is Gallia's l'Intendant l'Comte de Bastille directing the bar maid to bring drinks to his guests. Flags come into view. It is Régiment de Albanie en-route to join the Army of Gallian Lieutenant Géneral de Chevert now just past (northeast) of The Fulda Gap. 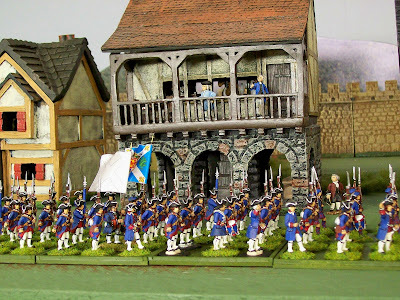 Albany/Albanie was one of three Scottish émigre battalions raised to support Bonnie Prince Charlie recover his throne. The gentleman in a purple coat is you. Another important person, Tradgardland's Prinzessin Alisona. Intendant Bastille has arranged for food and beverage to be brought to her apartment next door. Bastille: "My dear and honoured friends. I offer you the opportunity to march to Lt. General Chevert's Army. The Albanies will guard you along the way. I've taken the liberty to assemble your baggage at the rear of the column. The soldiers will await your pleasure here." Régiment Albanie halted as ordered. Frankzonian baggage at the rear. Hurtzhog, "Ja we must ... err... are honoured to attend the General. And dear reader there can now be no confusion in ol' Frankfurt Am Main to discombobualte our tormented Intendant and the vital Gallian magazine for which he is responsible. 1. Frankzonians generously on loan from Arthur. Thank you! 2. Buildings kindly on loan from Randy. Thank you! 3. 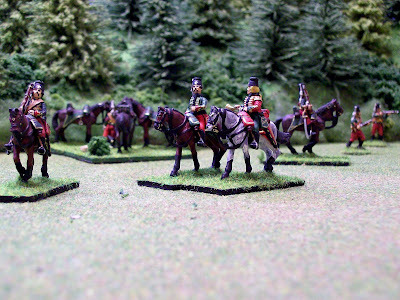 Albanie is mostly new Seven Years' War Crusader 28mm French, with three Minden command personnel sprinkled within given to me by Der Alte Fritz while the Highland garbed fellows are RSMs. They all fit in nicely, don't you think? 4. It is remarked in Volume II of Lawson's, A History of the Uniforms of the British Army, that Scottish émigre grenadiers wore kilts. See page 83. Now that's fun! 5. Flags are Vaubanner Graphics. 6. 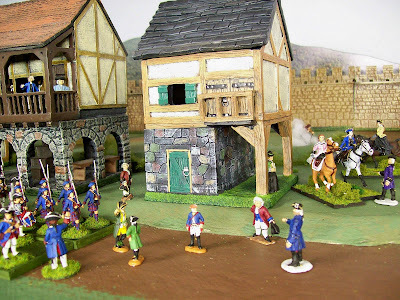 Buildings, most furniture and bar employees are from Miniature Building Authority. 7. 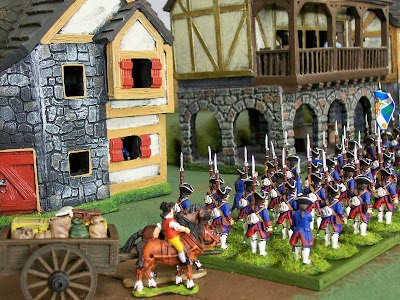 Régiment Albanie was completed this week - just in time for Der Alte Fritz's 4th Annual BIG BATTALION SYW BAR wargame scheduled for 10 October 1759/2009. 8. 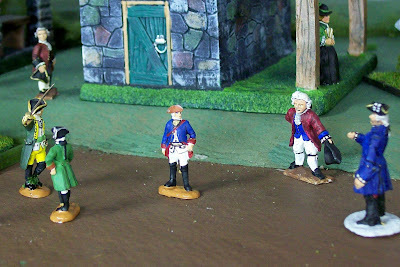 Der Alte, Randy, I and the rest of our BAR group paint historical uniforms. However, in the fashion of Brigadier Peter Young and Charles Grant, Sr. we place them in fictional settings without national characteristics for fun. 9. YOU can do any of this too! Comments welcome Gentlemen immediately below. Click on comments, if you please. 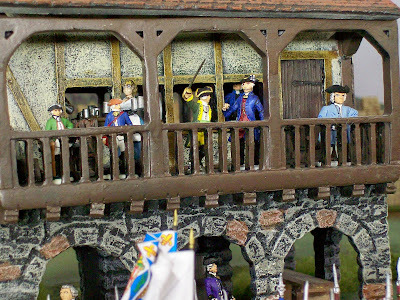 The Erbprinz Friedrich of Hesse Seewald and his staff confer atop the Muhlenburg as they watch the Gallian army on the march. (click the pix to enlarge the view). For the past two weeks, the army of the Erbprinz Friedrich has been retreating back towards the capital city of Gotha in the face of a large and powerful Gallian army commanded by Lt. General Chevert. The Erbprinz has crossed swords many a time with the wily Chevert, so he knows his opponent very well. And one thing that he knows very well is that Monsieur Chevert likes to attack. So with that in mind, the army of Hesse Seewald continued to retire from its strong hold in the Fulda Gap, back towards Gotha, and closer and closer to the territory of the King of Germania, called The Great. 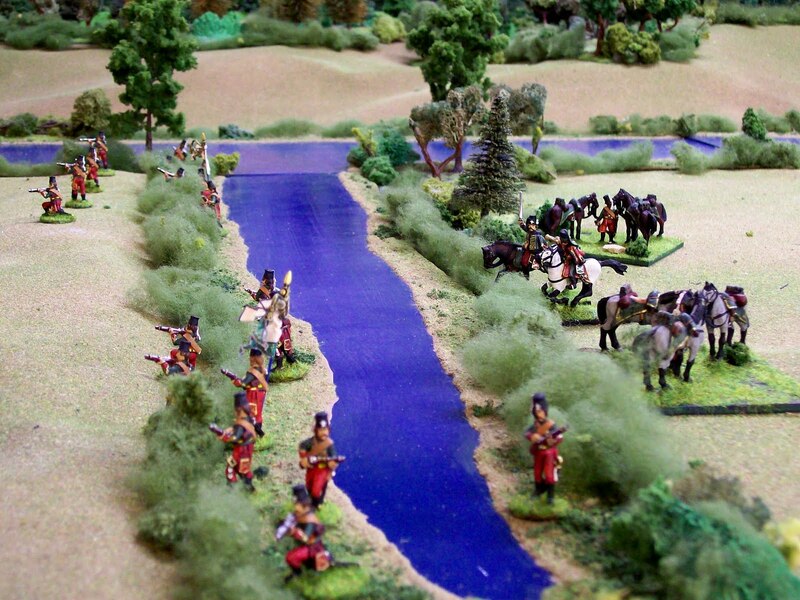 Perhaps in his advance, Chevert will stretch out his supply lines and become vulnerable to a counter-attack. Or, there might be an opportunity to combine the forces of Hesse Seewald and Germania and overwhelm the Gallians before they can react. Finally, the Erbprinz issues a bulletin to his army, announcing that they will retreat no further. He has found the perfect ground over which to wage a defensive battle. It is near the town of Schaumburg, only a few leagues away from Gotha. The news of the pending battle filters through the army and they are excited and ready to fight the Gallians at last. 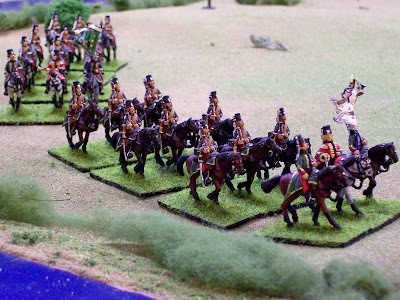 Friedrich draws up his army behind a series of low ridges that provide a comfortable screen for his army. 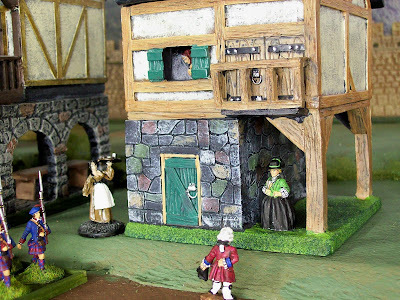 His left is anchored by a newly built redoubt - der Mummanschanz Redoubt, while his right is anchored upon Schaumburg Castle. The Erbprinz places an advance guard of freikorps and other light troops, commanded by Colonel von Kliest, forward of the key Schaumburg position to act as a trip wire to warn of any Gallian attempts to outflank his right and cut the army off from the capital city of Gotha. 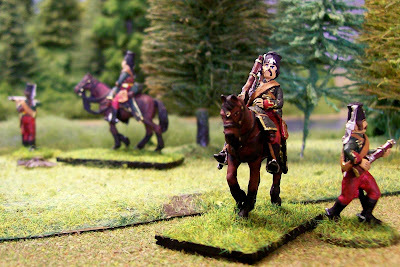 As the afternoon sun begins to sink lower on the horizon, the Erbprinz Friedrich assembles his officer corps on the Muhlenburg for a reconnaissance of the battlefield and the Gallian encampment across the way.